Skinner Auction offered this lathe on April 28 at their most recent sale in Marlborough. Have you ever come across those small ivory turnings looking like lost chess pieces at the flea market or antique shops, often with round heads, radial turnings and multi-piercings? This little foot peddle Ornamental turning lathe could have produced them. Made from polished brass and fruitwood with steel bearings, I could set it in motion with a twist of the wheel. Gazing down at the shinning gilt components and following through the working gear train I became completely lost as to where I was; time seemed to stop. It did not sell, but its little brother next to it did, at $140,000 and a less interesting 1865 time machine nearby went for $260,000. I can clearly remember, when I was 11 years old, wandering through a junk-shop in Kingston, New York, and coming across a small brass telescope, or part of one, actually. It had a 1” objective with three draws attached, all else was missing. It stayed on that shelf for 3 years, collecting dust with other pieces of odd and curious devices, while I dreamed about someday owning it. The summer heat and the smell of fresh mowed cut grass still brings back that memory, as that was how I saved the money, $10, to finally buy it. 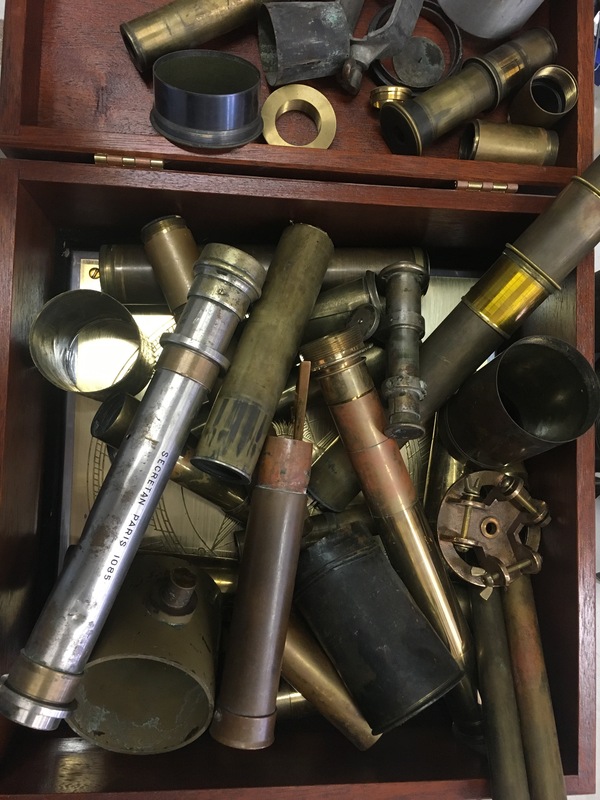 Today I have bins of antique telescope pieces, parts and lenses of every sort. I have boxes of 6” glass objectives, hundreds of erector tubes, and thousands of lenses. I have 17th century parchment telescopes, giant brass refractors, wooden barreled spy glasses and binoculars that are four feet long from the mid 19th century. I went on to build a fairly large company that produced thousands of telescopes, employed hundreds of workers, fabricated all kinds of science instruments and sold optical devices all over the world. And I still have that little telescope sitting in a box waiting to be reunited with its lost eyepieces.